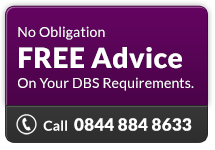 Lots of people are having problems correctly completing the DBS application form. Incorrect application forms often lead to delay and inconvenience to you and applicants. Where does the applicant (whether in voluntary or paid employment) carry out the main duties of the job? Does the work take place at the applicant's own home address, or does it take place in somebody else's home? If the applicant is working from their own home address, providing a service or care from the place where they live - then answer 'yes'. If the applicant is providing a service or care outside the place where they themselves live, and going to somebody else's home - then answer 'no'. Medical professions - Student Nurse /medical student/doctor/practice nurse/psychologist/physiotherapist. We understand some medical professionals are asked to administer health care to people who cannot visit a surgery or health care centre; however, they are carrying out their work in the patient's own home. Therefore, this is not a home based occupation. There may be times when a medical professional has their surgery in a part of their own home. You need to determine whether this should be classed as a home based occupation. Overall, the majority of applications for medical positions are not home based occupation. Social Care for adults - Domiciliary care worker/carers/befrienders/person in charge/delivery drivers. For the Adult workforce, the Department of Health has confirmed that only those individuals who take part in the Shared Lives programme are to be classed as a home based occupation. Furthermore, this extends only to the primary carers of the adult, and not the adult members of that household.